I'm into Marc Maron lately. Him and James Altucher. Discovered the former, rediscovered the latter. I wondered why and now I know. They are both compelling for the same reason. They don't hide the dark side, when the whole culture is about hiding. They were hurt, they were hurting and they have failed. Just like me and you, but we don't dig into it. They do it for us. Opening up. Being honest, therefore vulnerable. They allow the chaos to emerge. This is also why I crave for Maron's or Louie CK's stand up, and only like Seinfeld's. Maybe it's a generational thing. Despite the fact that they are only one decade away. Seinfeld's message is: I'm a legend - great, talented and hard working! 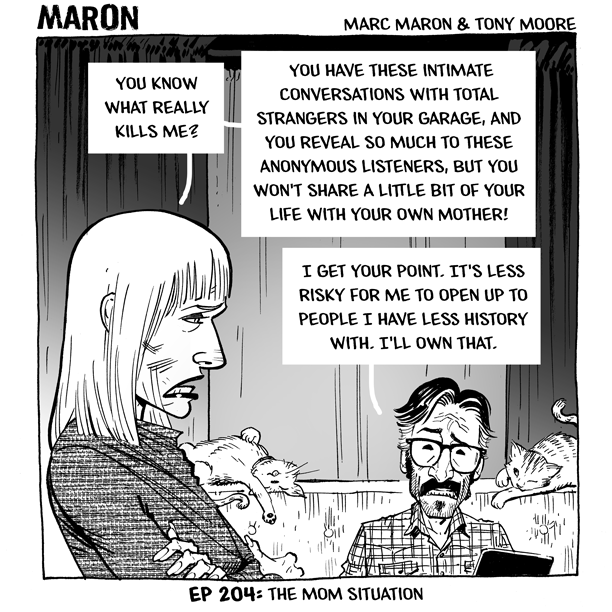 and Maron's: Maybe I am talented, but fucked up as well. When you ask what or why, old school Seinfeld will say: Here's what, and here's why, while Maron: I don't know, maybe this is what and this is why. Presumably it's because Maron was seeing therapists for years, while Seinfeld doesn't believe in therapy at all.